Our range of products include 3m car care - gift card - gift voucher. 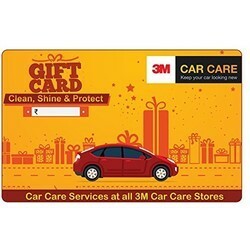 3M Car Care is a one stop destination for keeping your car looking new : Inside - out with our trained professional care across 100 stores in 32 cities .With these Gift Cards you can avail range of services which will not ensure that your car is well cared, maintained &protected with our Expert Care3M Car Care Specialized Treatment. Looking for Car Care - Gift Cards - Gift Vouchers ?